Apple is preparing to open its third retail store in Beijing this weekend, with the massive new Wangfujung store representing yet another high-profile entry for the company. The Next Web was on hand for the media preview today, gaining an early look at the new store and hearing from Apple retail chief John Browett, who also acknowledged that Apple is working to open a new store in Shenzhen, China. M.I.C. gadget shares more photos from the new store, noting that the ground floor is dedicated to product displays while the second floor offers support functions such as the Genius Bars and training tables and the basement houses additional training tables, a kids' table, and the largest range of accessories available at any store. 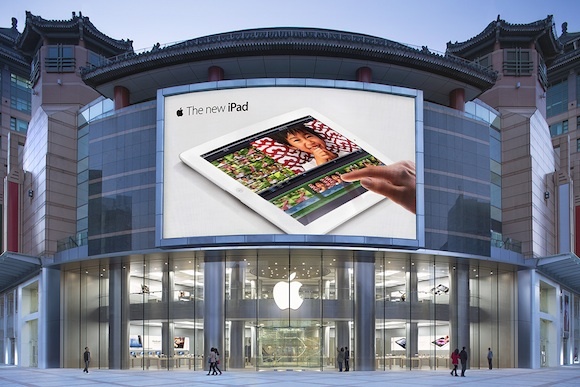 The modern design of the Apple store paired with classic Chinese architecture looks gorgeous! Am I the only one who thinks this looks kinda ugly? Pretty sure you are the only one. So the citizens can finally walk past an Apple store and say "I make these products. They are charging WHAT?!?! for it?!?" Get out of this "stereotype-thinkng" mode and your condescension. All Chinese aren't the beleaguered "poor" which you people insist on championing. Most likely most of those "poor" Foxconn employees are quite happy to have their jobs. Hm, why does China have so many Apple stores yet we have none here in Taiwan? Lots of people here own Apple products and there are a million authorized resellers that mimic the Apple store as closely as they can. A real Apple store would get swarmed if it opened here in Taipei. Because Taiwan is China ? Hong Kong is also China and Apple product are the cheapest in the world there. Well it is and it isn't. Hong Kong differs hugely from mainland China. As well as being an SAR It's almost completely Tax Free as well. As it is, you'd need a team of sniffer dogs to try and find a tax in Hong Kong - with no sales tax, no capital gains tax, no VAT and plans in the pipeline to phase out stamp duties, the people are less than enthusiastic about direct taxation. Income tax, or salary tax as it is known, is set at 2% for those earning less than HK$35,000 a year, 8% for HK$35,000-HK$70,000, 14% for HK$70,000-HK$105,000 and 20% for anything exceeding that. This low level of taxation brings Brits, Aussies and Americans by land, sea, air and camel to escape their native countries' tax regimes, contributing to Hong Kong's internationalism. Similarly, corporate tax, (or profits tax as it is known), is set at the bargain rate of 16% of assessable profits. All in all, the government gets it hands on very little money through direct taxation. This allows SMEs to flourish and encourages would-be entrepreneurs to throw their hat into the business ring. Looks great. There's something about the placement of that iPad billboard tho..
Dude, I don't get how you Taiwanese STILL feel you are rich or something compared to mainland Chinese TO-DAY. Taiwan's population is like what..that of Beijing? Get over yourself. It ain't 1982 no more. Let me guess, you're Chinese? Taiwan is it's own country. Maybe you're thinking of Hong Kong.